A new poll shows the Conservatives remain in the lead in national voting intentions and hints that co-operation between the Liberals and the NDP might not be able to change that. The poll by EKOS Research for iPolitics, conducted November 20 to December 3 and surveying 5,433 Canadians by interactive voice response, suggests the Conservatives have the support of 32 per cent of voters, with the New Democrats trailing at 26 per cent and the Liberals at 24 per cent. The Conservatives are in front in Ontario, Alberta, Manitoba and Saskatchewan, while the poll gives the edge to the New Democrats in British Columbia. The Liberals are up in Atlantic Canada and the Bloc Québécois is narrowly ahead in Quebec in a three-way race. More interesting, however, are Canadians' second choices, particularly in light debate about the need for opposition parties to co-operate since the federal byelections at the end of November. The second-choice question suggests the case for combining the Liberal and NDP votes is not as clear cut as some believe. Conservative voters are not in too much danger of going anywhere: fully 43 per cent of them said they had no second choice after the Tories. But assuming a respondent's second choice is a good indication of where their vote might go in the case of Liberal-NDP co-operation, the poll shows just how much the opposition's support could scatter. Among Liberal voters, 43 per cent picked the NDP as their second choice while 23 per cent opted for the Conservatives. 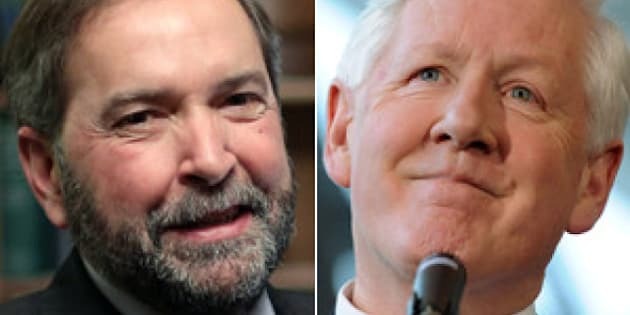 While that does boost the New Democrats considerably, it does not overcome the Conservative lead -- distributing the Liberal votes to the other parties according to the second choice responses, and removing those who said they had no second choice, would give the Conservatives 40 per cent support to 38 per cent for the NDP. For New Democrats, 37 per cent would opt for the Liberals and 18 per cent for the Greens. Distributing their votes to the other parties would bump the Conservatives up to 38 per cent and the Liberals to 36 per cent. Of course, if the Greens are also removed from the equation the numbers for the remaining opposition party are increased significantly. However, at that point the exercise becomes increasingly hypothetical. It is not possible to determine, for example, which party those Green voters who listed the Liberals as their second choice would choose as their third option if a Liberal candidate was not on the ballot. Nevertheless, the potential for votes to leak to other parties (for example, a considerable number of New Democrats in Quebec would turn to the Bloc rather than the Liberals) is strong, making any sort of co-operation between the two main opposition parties far from a slam dunk. They may need a better solution than this Hail Mary pass if they hope to defeat the Conservatives in 2015.